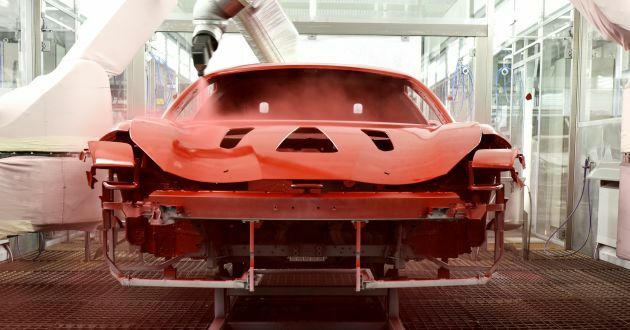 Ferrari has introduced a new low temperature paint system which was developed in collaboration with PPG. The Italian carmaker is the first to adopt the Low Cure clear coats technology, helping it improve its sustainability in the process. The new two-component paint system employs a specially formulated clear coat which makes it possible for the car to be baked at 100 degrees instead of 150 degrees, reducing energy costs as a result. Additionally, the Low Cure resins also a new hardener that makes the paint more resistant to water and other contaminants. A more significant plus point of the new paint system is the ability to bake carbon-fibre and composite components together with the bodyshell, allowing for better colour uniformity between the various body components. By combining metallic basecoats with a gloss or matte pigmented clear coat, Ferrari has managed to produce no fewer than 61 different basecoat colours with the new technology. Previously in 2004, it became one of the first companies in the world to introduce a water-based paint system which lowered the environmental impact of its cars. Clearly, you have no idea what you are talking about. Do yourself a favor and research Italian work culture. I leave you with one trivia: Daytime napping is considered an acceptable culture in Italy, even at workplaces. If u deny our right to sleep at daytime, how to improve productivity? Like seriously, people are trying to educate you but you prefer to remain ignorant and listen to your own echoes. A total ignoramus that cannot be taught because he doesn’t want to learn. You have a very peculiar name, John May 9 Nangis. I don’t know why you call yourself that. This is not about MAS, or union, or working hours. What your saying has nothing to do with this news post or this website. Better you go another blog where your viewpoints would be more relevant (even if factually wrong). Agree with john above. In factory, the workers must be provided adequate rest to ensure they are fresh and working in a safe environment. It’s quite standard for heavy industries such as car assembly plants to break 15 minutes or more for every 2-3 hours work. Otherwise, injuries or death will likely happen. Do u know in Indon that it’s our custom to sleep during daytime? Like above Engineer said, sufficient rest is important to ensure safety & productivity. in spain, 2 hours lunch time is normal called siesta. Felali was pioneer of making red smexy. Never diss Rosso corsa. If you think Mazda’s Soul Red is the best red, not only Ferrari’s Rosso Corsa but Porsche’s Guards Red would like to disagree too. Ferrari’s red is called ‘Rosso Corsa’. Italy’s motor racing teams have used this shade of red since the 1920’s when representing their country. It may not be the best looking red, but it has a rich history. err… if i remember correctly Mercedes started to use this from model W210. It was stated in their brochure at that time.